Today is July 4th and to celebrate we took the girls to the 30th Annual Naturalization Ceremony at Seattle Center hosted by the Ethnic Heritage Council. My daughters were there to represent the Middle East as part of the Children of the World Welcome Committee. Of course there was red, white and blue everywhere to represent the American flag and it really was spectacular to see over 450 people from 70 countries become United State citizens! When we got home, we made this paper favor box that I had seen on a Pinterst board. But instead of filling it with cookies, we decided to add Jordanian almonds before dropping it off at a friend’s house. 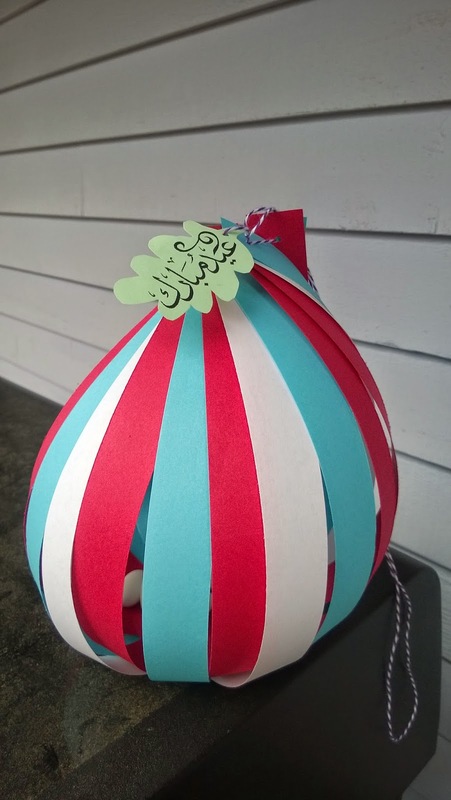 And we also placed an Eid Mubarak (Blessed Holiday) leaf tag and wrote on the back of it so our friend would know it was from us! 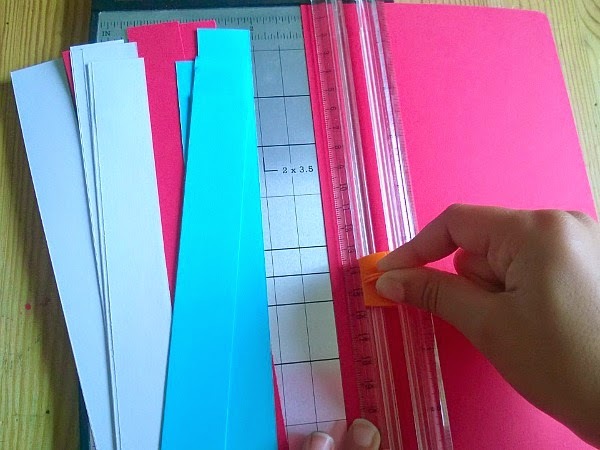 Use your paper slicer to cut your paper into one inch long pieces. 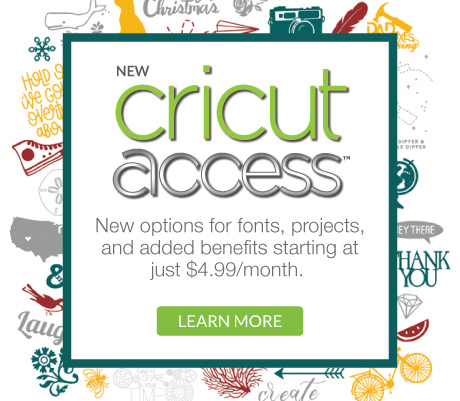 Use your circle punch to cut out two circles. 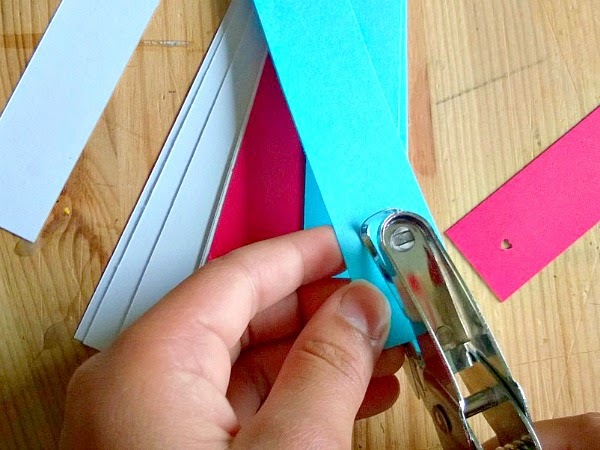 Punch holes on one end of all your strips of paper. 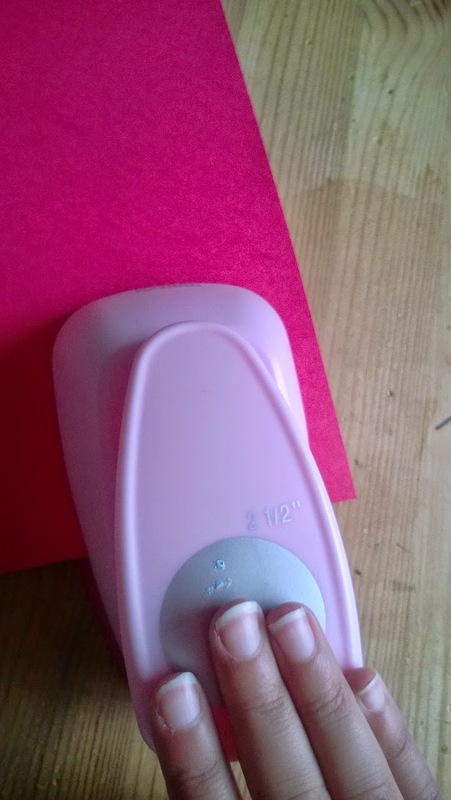 Place one circle on your table and cover the outside edges with glue. 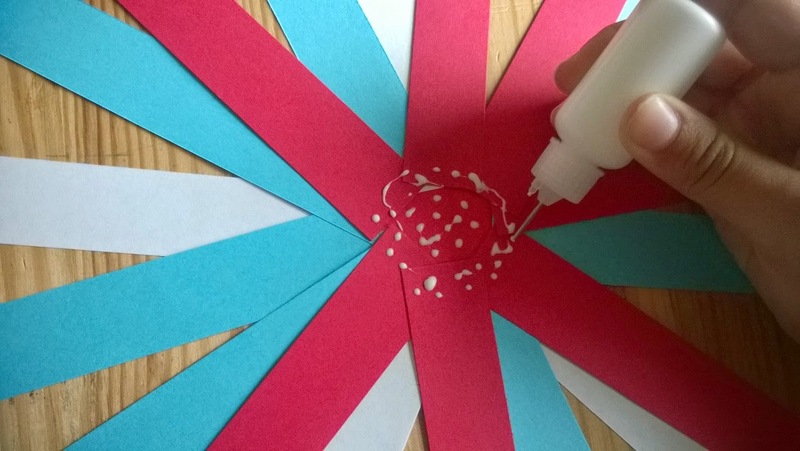 Place five white stripes of paper in a star design on the glue. Note that we are not placing the ends with the holes on the circle. 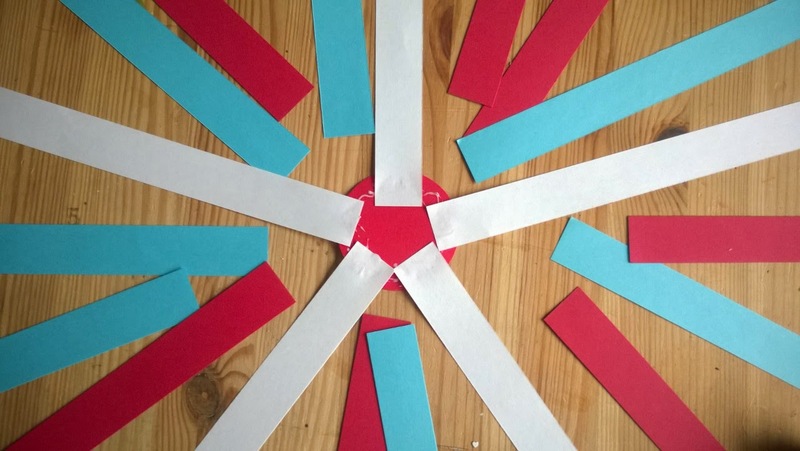 Place more glue and add three random stripes of red and blue between the white, except for the bottom, where you will only add two. 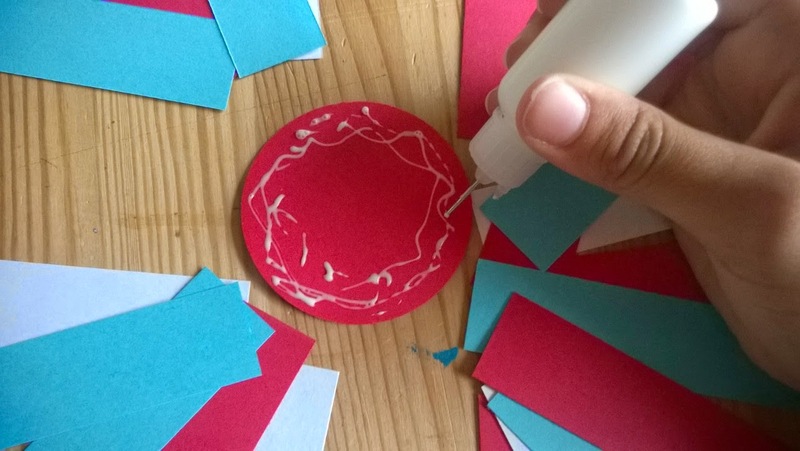 Don’t forget to keep adding glue as you add the layers, adding one more layer of glue before placing the second circle on top of everything. Give it a few minutes to dry. 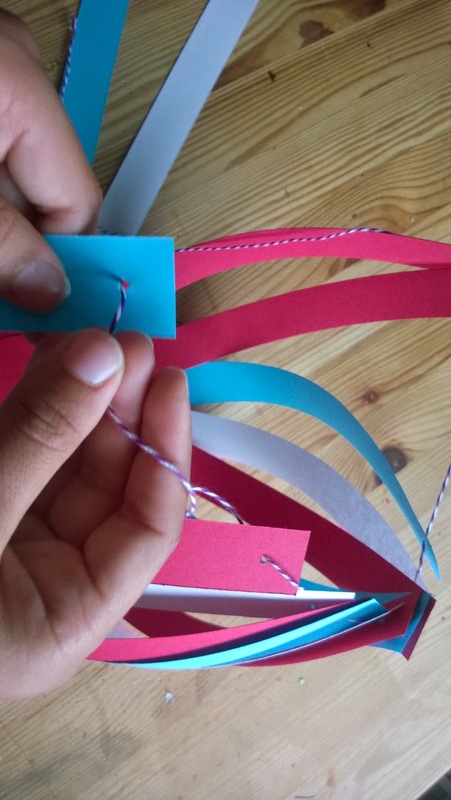 Start adding the twine to the top of the stripes of paper. When your stripes of paper are all combined, add candy to the bottom of your favor and tie off the top. 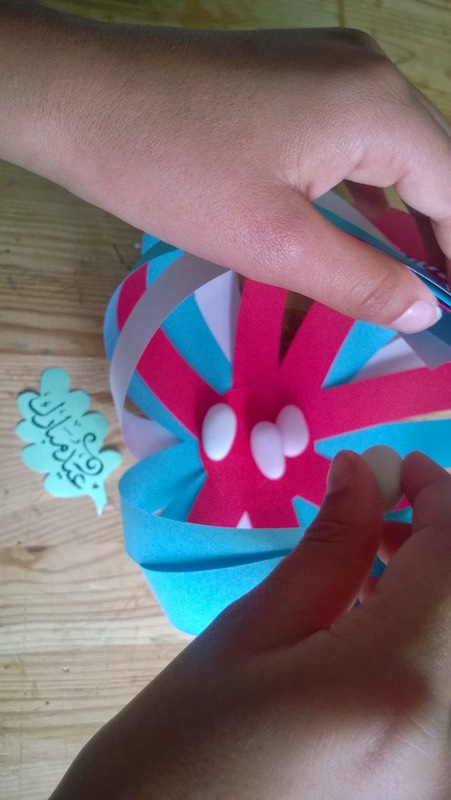 We also added a Eid Mubarak tag in the shape of a leaf that we hand cut. Here is what our eid favor looked like when it sits down. 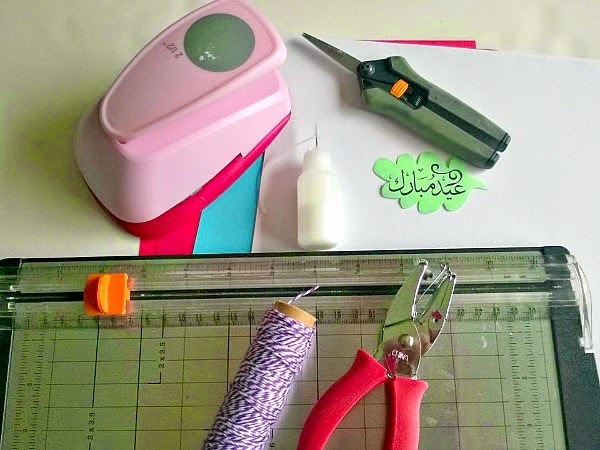 To check out more A Crafty Arab tutorial, please visit Pinterest.